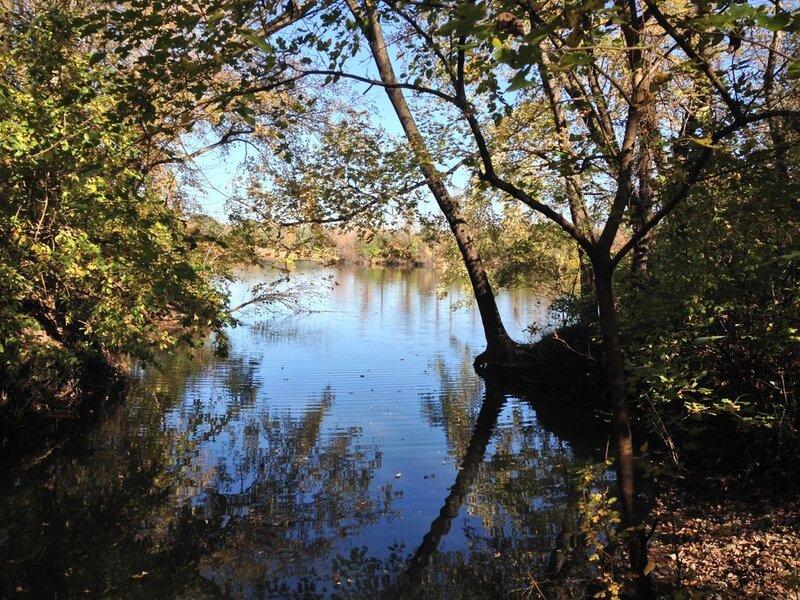 Known as Peterson's Pits to locals this park is found north of Ames. It's a twofer of sorts with the Skunk River dividing the park into East and West. 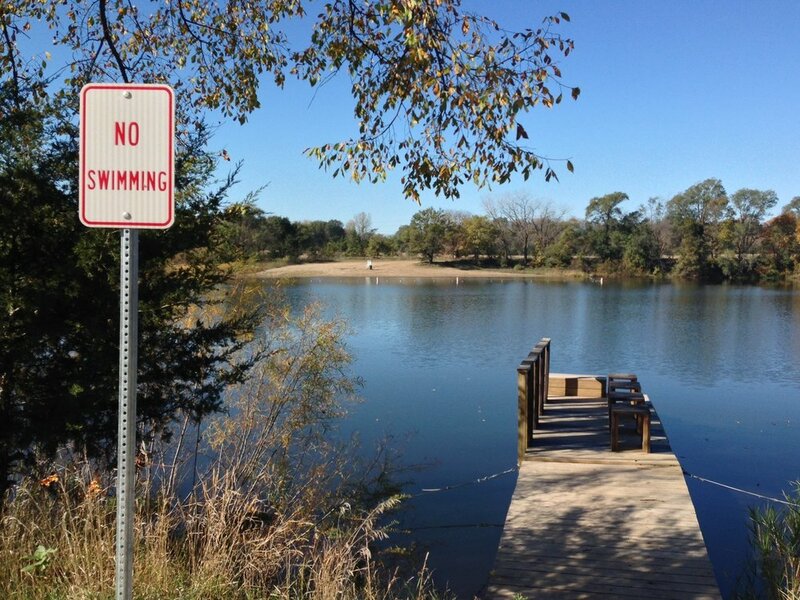 As former gravel quarry, three small lakes were left behind for recreational use. Winding around the water in a series of loops are eight miles of off-road trails. This was my first visit to the park with a mountain bike. As an off-road biking novice, I was hoping the trails would be scaredy-cat friendly with an easy terrain. I was in luck! Wide, easy to spot dirt trails took me through timber. Smooth grass trail flanked the edge of a prairie. Things turned sandy in spots along the river bottom but wasn't difficult to manage. All were in good condition and a perfect match for my lack of riding skills. A fat bike would be fun to ride here on snow covered trails. There's also a great picnic shelter overlooking a lake that would be a great spot for coffee outside. I had the place to myself and had a blast. It was fun to roll the small hills. I felt zippy around corners and wondered if maybe not all my nerve has disappeared! Perhaps there's hope for this old dog to learn how to shred (as the young whippersnappers would say) off-road trails. I recently had the pleasure of riding the Iron Giant across the prairies at Neal Smith National Wildlife Refuge. With beautiful weather and a conservation-oriented atmosphere it was Happy Riding at it's best. 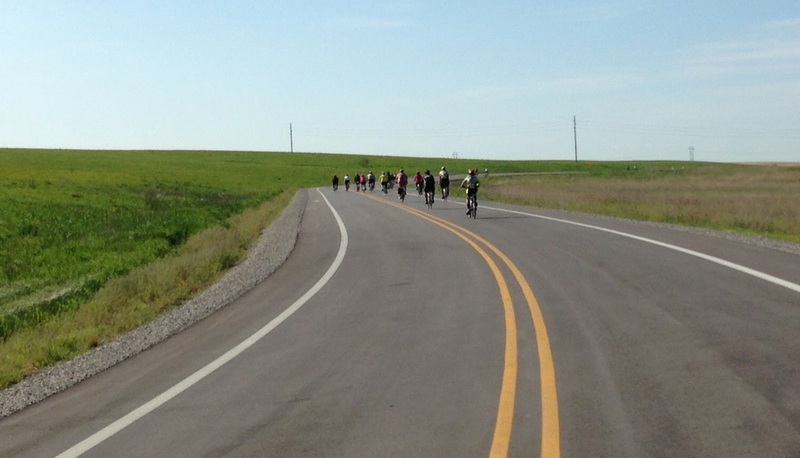 The first annual Pedal the Prairie, hosted by Friends of the Neal Smith National Wildlife Refuge showcased the new bike lanes flanking Prairie Parkway. Closed to automobile traffic, the road was comfortably busy with over 500 cyclists pedaling their way up and down hills, stopping to view bison, native wildflowers, and toss seed bombs. All genres of cyclists participated from those fully kitted out on road bikes to kids with bells, baskets and handlebar streamers. What a happy sight! My sister and I prepped for the ride with coffee outside session at Entryway Park in Prairie City. Beans from Coffee Culture and two slices of pie. Rhubarb and Apple. Perfect! After fueling up we pedaled the scenic (and hilly) 5 miles to the Welcome Center where we checked out displays, received great giveaways, and had lunch. Next was a 3 mile walk along Tall Grass Trail. What views! Before heading back to Prairie City we stopped at the bookstore inside the Prairie Learning Center and purchased ride t-shirts. I also bought a Sparky the Bison shirt. Sparky lives at the refuge and survived being struck by lightening in 2013. Check out his interesting story here. The return trip was a bit quieter with fewer folks on the road. Arriving at a rather empty parking lot it appeared we were some of the last to return. 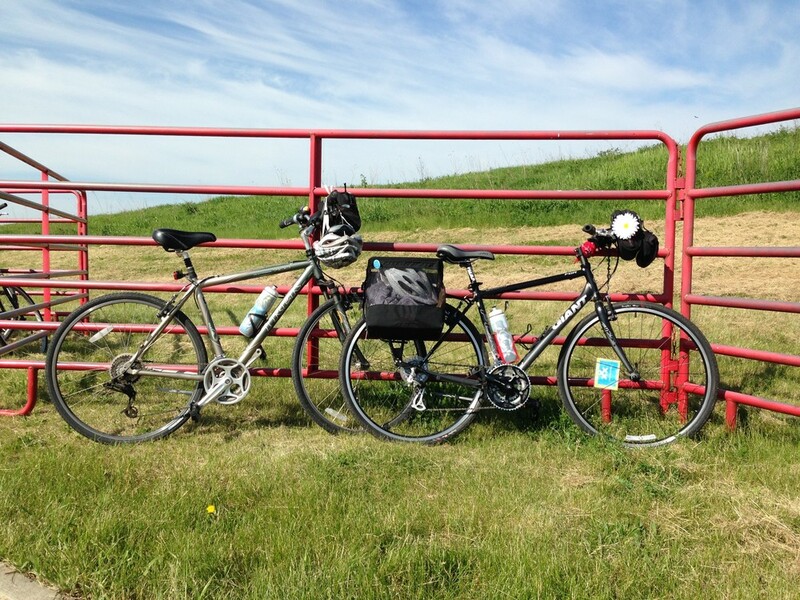 If you missed the opportunity to participate in Pedal the Prairie, don't fret. You can pedal anytime this summer. Bike trails are open during daylight hours and lots of events take place at the refuge throughout the year. Plan a visit and a pedal along the prairie. 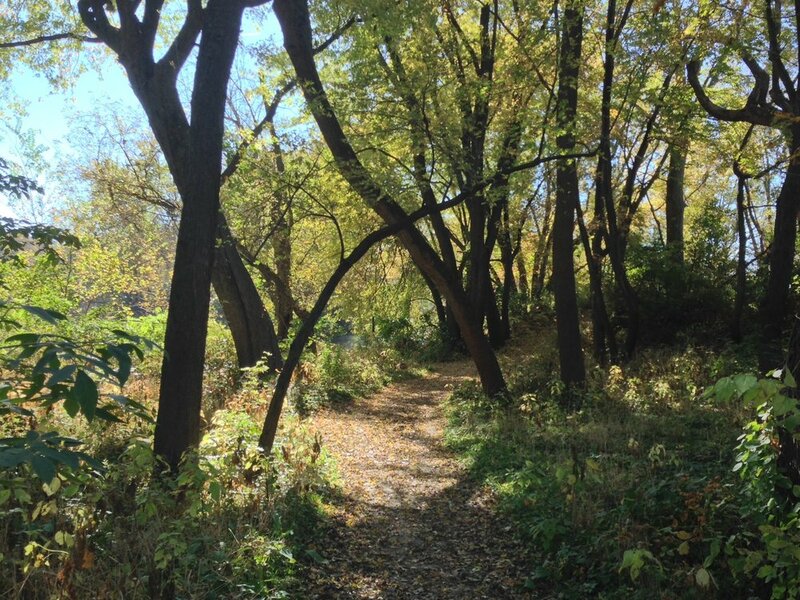 Considered the "crown jewel" of the metro area, Raccoon River Park is home to the 3 mile crushed rock trail circling Blue Heron Lake. Out on this trail you quickly forget you're in the city. 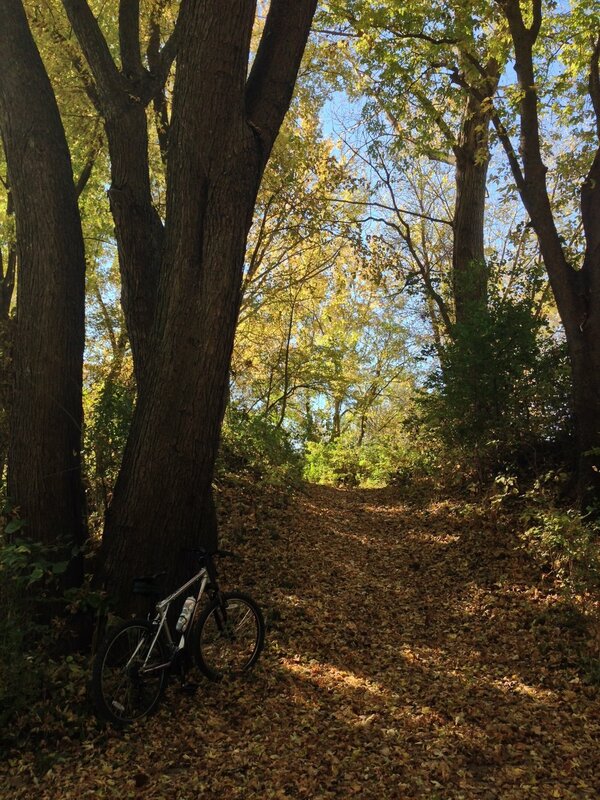 This quiet location and the wide limestone path is a perfect spot for kids to ride their bikes. The trail is a popular place for walkers and runners so plan for a slow relaxing ramble on the bike. A playground, beach, nature lodge, sport complexes, and fishing pier nearby there are lots of ways families can have fun. Calling this a ride is a bit overzealous. 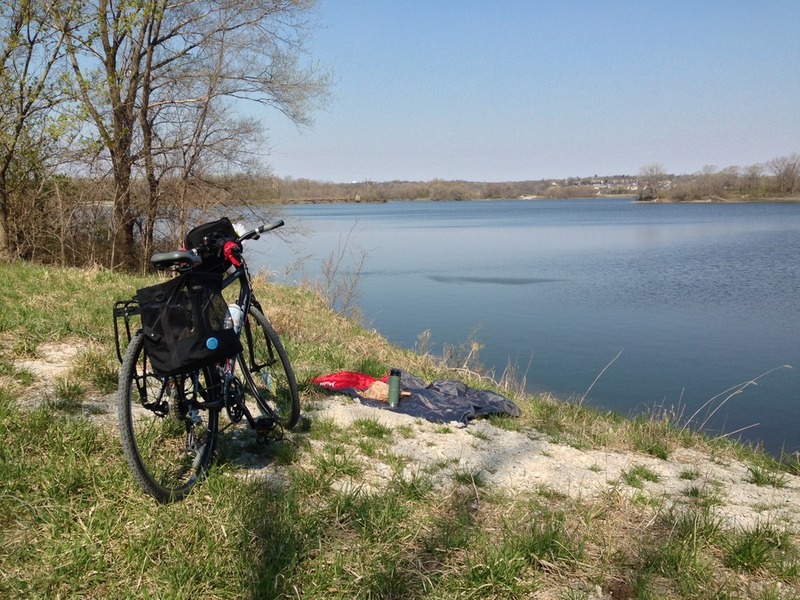 While there was pedaling involved, my bike merely served the purpose of toting me and breakfast around the lake. The goal: to find a pretty spot for a picnic and bird watching. There wasn't much for mileage nor there was much effort, only meandering. It was perfect! A cool breezy morning, sunshine, a thermos full of coffee, breakfast, and birds. What was missing was binoculars! A pair would have come in handy to get a better view of the Mergansers fishing for their breakfast. I enjoy using my bike for errands and exercise. But, my favorite way to put my bike to work is for transport to a peaceful out out of the way spot. A rented Surley Pugsley courtesy of As A Dad LLC was starting to feel like part of the family. The only thing missing was my handlebar bag. I've gotten hooked on that piece of gear and when it's not in use it just doesn't feel right. I filled the void by using a fanny pack....yes you read that right. Full Doris, pedaling with pride! A showcase for conservation work in central Iowa, the Chichaqua Bottoms Greenbelt was born in 1960 when damaged land along the Skunk River was purchased by Polk County. It's network of grass trails are great places for hiking, snow shoeing and cross country skiing...and fat biking! Viewing Platform as seen from space. A wildlife viewing area is located northeast of Bondurant at mile marker 93 on US Highway 65. There is paved parking, restrooms and a bird watching platform designed in the shape of a raptor. Decking boards are in the form of primary feathers. The viewing area has binocular stations for those who left their field glasses at home. The greenbelt was all mine this sunny afternoon. The trails were in good shape and a perfect match for the fat bikes wide tires. I took my time pedaling north to the ponds. The water was quiet with only a Blue Heron using the pond. Riding through sections of tall prairie grass I thought of Laura Ingalls and other pioneer families who traveled through similar landscapes. Imagine what she would have thought having seen someone ride past the covered wagon on a fat bike!